Mindful of the mission entrusted to us by Jesus Christ through the Roman Catholic Church, we actively, publicly profess our faith through worship and evangelization; nurture our faith through educational and formational opportunities; promote social justice; foster unity, charity, and respect for all legitimate expressions of our Catholic Tradition; create an environment that is safe, hospitable, and welcoming to all. Not officially a parishioner yet? 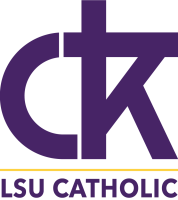 It is a gift you are considering making CTK your parish family. Please fill out the form and return to Christ the King, P.O. Box 411, BR LA 70821 or drop it to the CTK office. Please note all current LSU Students are considered parishioners until they graduate and do not need to fill out the form below. Click to find out more about our Hispanic Ministry, Sacraments, and Spiritual Resources!